No Compliance; No Compromise; No Mine! 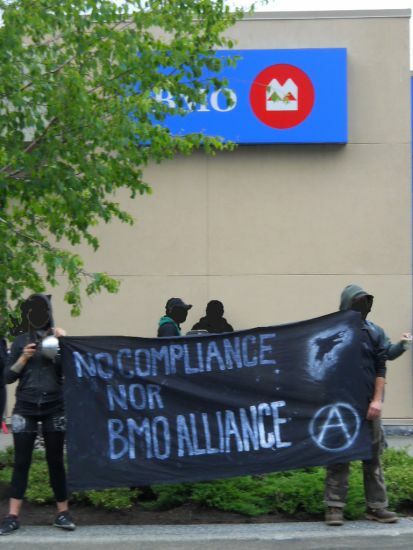 Banner No Compliance or BMO Alliance. No Compliance, No Compromise refers to the developers, Compliance Energy Corp.
On Monday June 4th in Courtenay, BC (Central Vancouver Island) anarchists executed a massive poster and propaganda blitz, followed by a Noon Hour "Casserole" noise demo outside of a local BMO Branch to give notice that there will be no Raven Coal Mine. "These signs were posted throughout the downtown area of Courtenay and as far south as 26th Street," Cpl. Andy Irvine of the Comox Valley RCMP says in a news release. "The signs are in reference to the Raven underground coal project." As Anti-Coal posters were wheat pasted and "Stop Raven Coal: Direct Action gets Satisfaction" handbills were passed out all over the downtown area passerby's stopped and engaged in dialogue about their experiences with the effects of mining and their opposition to the proposed Raven Coal Mine. Compliance Energy Corporation (CEC), as part of their Comox Joint Venture, have their eye on the coal under 29,000 hectares of land stretching from Fanny Bay to Campbell River, and has claims to even more. It is looking at both underground and open pit mining. At Raven, the company plans to extract 30 million tonnes of raw coal in the next 16 years, shipping out 13 million tonnes, and leaving behind 17 million tonnes (nine million cubic meters) of potentially acid-generating rejects in the hills above Baynes Sound. 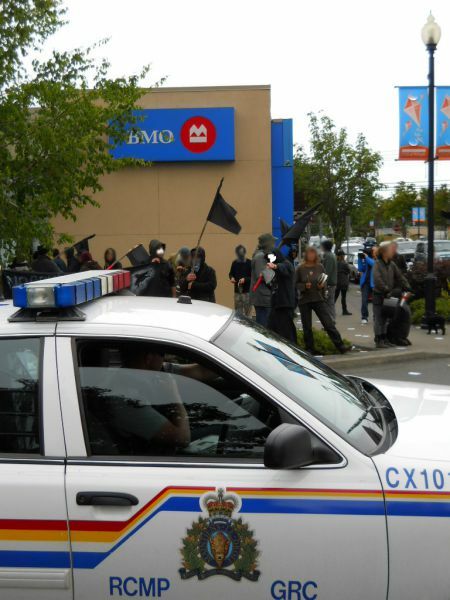 The noon hour "casserole" outside the local Bank of Montreal (BMO) branch was to highlight their complicity with the project. A banner was dropped from the branch reading "BMO Supports Coal: Stop The Mine!" as people banging pots and pans gathered on the corner outside and gave out handbills. For over a half hour, information promoting direct action and stopping the mine was distributed, while a cacophony of house hold 'instruments' drew attention to the action. A banner held out front of the noise demo stated "No Compliance Nor BMO Alliance." 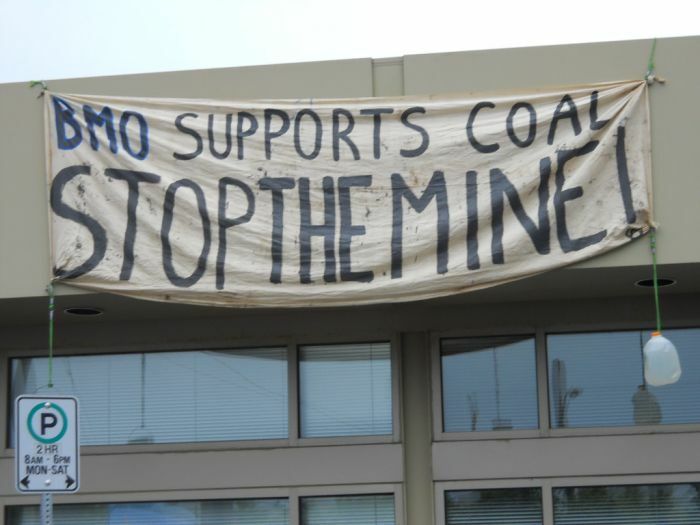 The almost unanimous opposition to Raven Coal (and all the other CEC projects) from locals highlights that this project is not just controversial, it is unwanted. In a valley known for it's legacy of mining and struggle, the people here haven't forgotten their history. The Quinsum underground coal mine just North of Courtenay, outside of Campbell River has been operational for over twenty years despite widespread opposition leading up to opening the mine. While the 'Casserole' demo was happening, banners were dropped along the Main Island Highway between Cumberland and Courtenay and also on the Old Island Highway, closer to the proposed site. These were still visible days after the action. The local RCMP are assessing the damages of the action to be in the range of $2000-$5000. How can we quantify clean air and water? Experience has shown us that despite lively vocal opposition projects of resource extraction are pushed ahead, often at the expense of the local community and environment. Communities are consulted only to be disregarded, environments assessed only to be destroyed . We will not be ignored. We will stop this mine!